Chemical structure of the major constituents of silymarin. These compounds are often collectively referred to as silymarin, and have a host of different effects. Through modern research, we have now been able to determine that milk thistle is not just good for our livers, but can even help protect our brains and auditory systems! Due to the many milk thistle benefits we decided to write up a list highlighting, in our opinion, the top 5 milk thistle benefits for health. One of the most frequently asked questions we get is if we have anything that will produce weight loss. Unfortunately, the answer to this is always a ‘not really’, which is due to the fact that weight loss is highly multi-faceted and there aren’t really any compounds that can out-right make you lose weight. There are however a plethora of supplements that can help promote weight loss alongside a healthy diet and exercise regime. Milk thistle is one of these supplements, and milk thistle weight loss effects can be traced back to the silybin content. Silybin appears to be able to significantly hamper the accumulation of triglycerides, which are the main component of body fat. This accumulation has been shown in highly controlled laboratory experiments to decrease triglyceride accumulation by up to 40%! Realistically, when it comes to supplementation, we likely will not see a reduction of triglyceride accumulation to such a magnitude. That being said, there does seem to be a triglyceride accumulation inhibiting effect associated with taking a milk thistle supplement, which in combination with a healthy diet and physical exercise, can help enhance weight loss. Milk thistle, again through silybin, is able to induce insulin induced gene 1 (INSIG 1) and insulin induced gene 2 (INSIG 2). By inducing INSIG 1 and INSIG 2, milk thistle is able to halt the differentiation of fat cells called adipocytes. Adipocytes are specialized in storing fat, and make up what we call ‘body fat’ which is also known as adipose tissue. By inhibiting the differentiation of adipocytes, milk thistle may help minimize body fat. Milk thistle may also help regulate glucose transport, another important factor in weight loss. Through a receptor called Glucose transporter type 4 (GLUT-4), glucose is shuttled into adipose tissue. By doing this, the potential energy from glucose is stored for us to use later. However, with over-consumption of glucose and/or over expression of GLUT-4, an abundance of glucose can be shuttled into adipose tissue. This will increase the mass of adipose tissue, which will eventually lead to an increase in body fat. Milk thistle seems to be able to reduce glucose uptake into adipose tissue by regulating the activity of GLUT-4. Through this mechanism, milk thistle could yet again help aid weight loss. Overall, it appears that that the silybin contained in milk thistle, in particular, can be a great adjunct to a healthy diet and exercise regime. It will help enhance the effects that good diet and exercise will have on weight loss and overall health. For this reason alone, we consider milk thistle to be a highly beneficial health boosting supplement! Most traditional milk thistle uses have been catered towards supporting liver health, which modern research has now been able to verify. Milk thistle liver detox benefits are plentiful, ranging from general protection of the liver to down right helping repair damaged livers. With this is mind, milk thistle is a great ingredient to take on a daily basis to keep our livers healthy, but is also good to take alongside substances which are not all too good for our livers, such as alcohol. In fact, it appears that one of the positive effects of milk thistle supplementation before alcohol consumption is hangover support. In terms of protection, milk thistle achieves this through a few different mechanisms. The first of which is to prevent toxins from entering and forming in our livers. There are many environmental toxins which get filtered through our livers and some of these toxins can be very damaging. An often-cited toxin which can very negatively affect our livers is phalloidin, from the death cap mushroom. Traditionally the only antidote to death cap mushroom poisoning has been milk thistle liver detox. This is due to the fact that milk thistle blocks the transport system that is responsible for shuttling phalloidin into liver cells. Of course, on a daily basis we are not exposed to death cap mushroom poisoning. That being said, milk thistle may also protect our livers from environmental toxins that are being metabolized by the liver. One of the liver's main priorities is eliminating toxins from our bodies before they can do any damage. Doing this, however, requires a lot of work by our liver, and all of this workload results in the production of oxidative free radicals. This heightened state of oxidation in our livers is usually taken care of by our bodies own antioxidant molecules such as glutathione. In situations where the oxidative load is too high for our natural antioxidant systems, our livers can become overwhelmed by oxidation. This will result both in damage to the liver and a reduced ability of the liver to metabolize environmental toxins. Milk thistle liver benefits include providing some extra help with clearing out oxidative free radicals in these situations by boosting various antioxidant systems in our livers. Milk thistle may boost levels of one of the main antioxidant molecules in our bodies, reduced glutathione (GSH), while also boosting catalase, glutathione reductase (GR), and glutathione peroxidase ( activities. Reduced glutathione reductase, glutathione peroxidase and glutathione interact to reduce hydrogen peroxide to water, in order to protect the cell from oxidative damage. Now, it may be the case that our livers have been working too hard already and have incurred some oxidative damage. In this case, milk thistle liver benefits may help the liver regenerate. It does this mainly by helping regenerate liver cells by increasing protein synthesis in the liver. The exact mechanism behind this regeneration is not exactly clear, however, research seems to indicate that silybin from milk thistle can stimulate RNA polymerase I activity. By stimulating RNA polymerase I activity, milk thistle can encourage the formation of ribosomes in the liver. These ribosomes, can then help stimulate protein synthesis in the liver, which may lead to regeneration of damaged liver cells. Overall, it appears that milk thistle liver benefits make it a very healthy compound for our livers. Again, combined with a healthy diet, milk thistle may be a great ingredient for boosting overall health. The healthier our livers are, the healthier our bodies will be because our livers are one of the main lines of defense for our whole body. Based on this, it may be smart to utilize a milk thistle liver cleanse, especially after alcohol consumption to utilize the milk thistle hangover prevention effects. As we age, our bones can become weaker. This is an issue that especially affects women, which is due to the fact that bone density/bone strength is highly dependent on estrogenic systems. As women age, estrogenic systems can start to decrease, as does bone strength along with it. Silymarin from milk thistle appears to be able to modulate estrogenic activity in a manner that it highly beneficial for bone strength. This effect is not limited to women and applies to men too, as estrogen also plays an important role in the physiology of male bodies and their skeletal systems. That being said, the male body is much less reliant on estrogenic functioning, which is why weakening of bones tends to occur earlier in women than it does in men. It appears that through estrogen receptor beta (ER-beta), milk thistle can help pull minerals into bones. More specifically, it appears that milk thistle can significantly increase serum levels of parathyroid hormone (PTH). PTH is an important regulator of calcium and phosphate in bone metabolism. Short bursts of increased PTH can activate osteoblasts, which are cells that help synthesize bone. By activating osteoblasts through PTH, milk thistle may be able to prevent age related decline in bone strength. 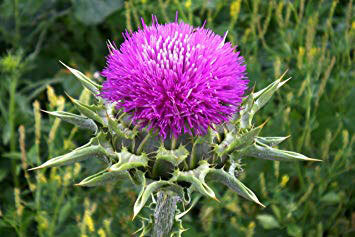 Furthermore, milk thistle may also help heal bones after injury. Taking into account the effects of a milk thistle supplement on bone health, it may be good to take a milk thistle supplement alongside bone healthy vitamins and minerals such as Vitamin D, Vitamin K and calcium in an effort to keep our bones strong. This would be beneficial for both preventing acute bone injury, such as in a sports injury and for fortifying our bones as we age! As you may have become accustomed to, we like to delve deep into research to find novel effects that some of our products may have. Something many of you however do not know is that a lot of us are also highly interested in music. In fact, we have a few professional musicians currently on the Nootropics Depot team! As many musicians know, hearing damage is often a very real concern as both a performer and as a listener. This is why we were especially excited when we discovered that milk thistle may help protect our hearing when we are exposed to loud sounds. Exposure to loud sounds causes hearing damage by producing reactive oxygen species (ROS) and reactive nitrogen species (RNS). Both ROS and RNS can induce oxidative damage on the delicate cochlear hair cells inside our ears. Damage to the cochlear hair cells can produce hearing damage which in the long term will decrease the sensitivity of our auditory system. This, of course, leads to reduced hearing capabilities. With this in mind, researchers determined that if you could get compounds with oxidation regulating effects to the cochlear hair cells, then a core process in hearing damage could be significantly halted. Tests done with milk thistle showed that its silymarin content is readily taken up in the cochlea and can protect cochlear hair cells from noise induced damage via a few different mechanisms. One of the main ways in which milk thistle protects cochlear hair cells is by attenuating DNA oxidation, which may help protect our auditory system from loud noise induced oxidative damage. A milk thistle supplement may also help protect against lipid peroxidation that occurs during loud noise exposure. The best way to protect our auditory system is, of course, making sure to either avoid loud noise environments or wear appropriate hearing protection. That being said, this is not always possible and some hearing protection cannot adequately protect our hearing from unexpectedly loud sounds. In this scenario, a milk thistle supplement, alongside proper hearing protection, would give a two-tiered protection from loud noise. Just like our cochlear hair cells, our brain cells are also susceptible to oxidative damage induced by ROS. In fact, our brain has highly specialized anti-oxidant systems due to the active nature of our brains. Our brains are constantly producing ROS because of its high energy demand. Some of these ROS even originate from the neurotransmitters in our brain. For example, upon metabolism of dopamine, strong oxidative metabolites can be generated. Usually our brain has the proper defense mechanisms against these ROS. However, sometimes our brains need a little bit of extra help. For example, as we age our anti-oxidant defenses start to decline, which leads to a higher susceptibility to oxidative stress in the brain. Milk thistle, being a great oxidation regulating ingredient, can quite robustly protect the brain from ROS. However, there are many oxidation regulating ingredients that could exert a general neuroprotective effect by acting as an antioxidant. What makes milk thistle unique is that it can work on various different systems throughout the brain that are involved in keeping our brains healthy. As we discussed earlier, dopamine metabolism produces large amount of strong oxidative compounds. Our dopamine neurons are well equipped to handle this oxidative stress. However, sometimes these defenses just aren’t enough. Milk thistle can both help neutralize ROS, and it can even help protect dopaminergic neurons in a more direct way. The silybin content of milk thistle may help directly stabilize the mitochondria of dopaminergic cells. Mitochondria are the power generators of our cells, and are easily affected by oxidation. By stabilizing these mitochondria, milk thistle has a very direct neuroprotective effect, which can help keep our dopaminergic system healthy. Another threat to our dopaminergic system and our brain in general is neuroinflammation. This can be caused by a large variety of factors, and is a very natural process in our brain. Similar to ROS, inflammation is often times dealt with very well by our brains. However, there are instances where our brains own defenses are not up to par. Inflammation in the brain is largely caused by inflammatory cytokines such as interleukin-1β (IL-1β) and tumor necrosis factor-α (TNF-α). Research has shown that the silybin content of milk thistle can help suppress IL-1β and TNF-α in the brain, which may help protect our dopaminergic system and brain. Milk thistle may also help halt the production of inducible nitric oxide synthase (iNOS). Activation of iNOS causes a very large release of the gaseous neurotransmitter nitric oxide, which has a large variety of effects throughout the brain and body. Nitric oxide release around our blood vessels is often times highly desirable as it will increase blood flow. Nitric oxide boosting supplements, such as L-Citrulline, are often utilized by athletes looking for more endurance. However, nitric oxide in the brain usually occurs alongside high amounts of oxidation. This can lead to the formation of peroxynitrite, a highly damaging oxidative compound. By halting the production of iNOS, milk thistle may be able to decrease peroxynitrite formation in the brain, which can produce a highly neuroprotective effect. Furthermore, nitric oxide is known to be an amplifier of inflammation in our brains. Thus, by halting iNOS production, milk thistle may help dampen inflammatory processes throughout the brain. Another good strategy for protecting our brains is making sure our brain is able to adapt and change. The main process behind this adaption and change in our brains is called neuroplasticity. Neuroplasticity is dependent on a whole host of factors. However, of the main drivers behind neuroplasticity is brain derived neurotrophic factor (BDNF). We go into a lot of detail what BDNF is in our blog on 7,8-DHF which we would recommend reading. The jist of it is that BDNF binds to the TrKb receptors, which then initiates a large signaling cascade which leads to growth, adaptation, and change in our brains. Neuroplasticity is a major neuroprotective mechanism in our brains, and reduced neuroplasticity can lead to a whole host of issues such as reduced cognitive function and reduced mood. Luckily, the silybin content from a milk thistle supplement is able to enhance neuroplasticity through the BDNF/TrKb pathway. By doing this, milk thistle may help enhance learning and memory, boost mood, and help protect our brain from various insults such as oxidation and inflammation. Overall, milk thistle appears to be highly neuroprotective and would be a great choice for a brain health enhancing supplement. Previous research and traditional milk thistle uses had mostly focused on its liver health promoting effects, however, these new found milk thistle uses make it a very interesting ingredient for enhancing overall health.